Women who leave school with few or no educational qualifications are less likely to have diets that meet current recommendations than women who attain more qualifications at school. We hypothesise that lower 'food involvement', meaning that food has a lower level of importance in their lives, explains the poorer quality diets of women of lower educational attainment. We administered Bell and Marshall [(2003). The construct of food involvement in behavioral research: Scale development and validation. Appetite, 40, 235-244.] Food Involvement scale to 242 women of varied educational attainment, of whom 127 were also asked how often they ate fruit and vegetables. 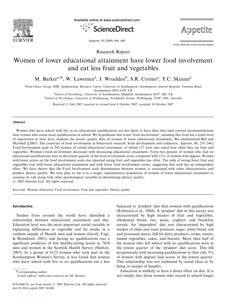 Women's food involvement decreased with decreasing educational attainment. Forty-two percent of women who had no educational qualifications were in the lowest quarter of the food involvement score, compared with 12% of women with degrees. Women with lower scores on the food involvement scale also reported eating fruit and vegetables less often. The odds of eating fewer fruit and vegetables rose with lower educational attainment and with lower food involvement scores, suggesting that each has an independent effect. We have shown that the Food Involvement scale discriminates between women, is associated with other characteristics and predicts dietary quality. We now plan to use it in a larger, representative population of women of lower educational attainment to examine its role along with other psychological variables in determining dietary quality. © 2007 Elsevier Ltd. All rights reserved.